John Michael Rowland, General Manager of Superior Seafood & Oyster Bar, a restaurant that holds a devout appreciation for its heritage in South Louisiana and carries out a mission to support local farmers daily by using Gulf Coast seafood, claims that, “It isn’t a southern wedding in the spring without a Cajun-style crawfish boil to kick-off your wedding festivities.The restaurant’s custom-built kitchen can accommodate large boils, equipped with four pots that hold 70-pounds of crawfish in each. The restaurant also has a new off-site catering rig that brings the boil straight to the celebration." It’s not a New Orleans wedding without a raw bar. In fact, Besh says, “I haven’t been to a Louisiana wedding reception without a raw bar. Or having the crab fingers and little crab fritters or crawfish in-season with pasta. I can’t imagine not having it.” At one of his recently catered events in a remote bayou in Southeast Louisiana, his team created a raw bar — along with the boil — featuring everything from chilled boiled seafood to chilled ceviche and shrimp — even a caviar station — all served over a huge bar made entirely of ice. 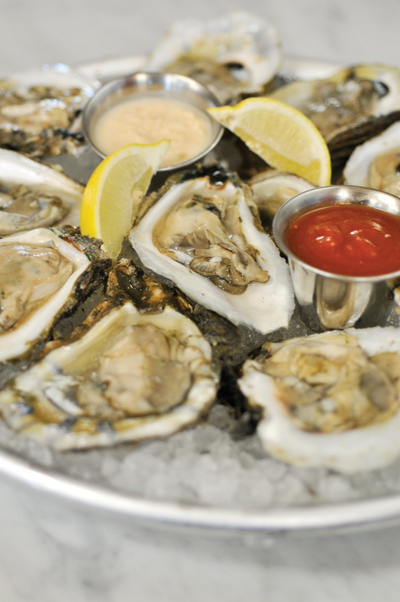 Superior Seafood & Oyster Bar offers traditional and non-traditional styles of Gulf Coast oysters for the in-house wedding-related event, including raw, chargrilled, Bienville, Rockefeller or their Angels on Horseback, which are wrapped in bacon and lightly fried. Offering a Gulf seafood dish as an entrée option for the wedding is practically de rigueur in the Crescent City. Naturally, there are loads of options, but the classics often feel the most special. Commander’s Palace offers a few suggestions for set menus, along with one that includes their decadent turtle soup, spiked with sherry, to start; followed by a pecan-crusted fish, topped with champagne poached jumbo lump crab, spiced pecans and a crushed corn sauce. The signature Creole bread pudding soufflé makes for a showy dessert. Superior Seafood — also with myriad group options — offers everything from a blackened fish Napoleon, topped with crawfish etouffée to New Orleans-style barbecued shrimp or their shrimp andouille brochettes: char-grilled, bacon-wrapped shrimp, stuffed with andouille and Monterey Jack cheese. Arnaud’s Restaurant one-ups the station trend by offering seafood-specific stops. Think a shrimp and grits station, a scallops with saffron cream sauce station, a soup station with seafood gumbo and turtle soup, as well as a station with oysters, shrimp and crab claws. Choose a Crescent City classic to sip at the bar with your nearest and dearest or serve as the signature wedding drink. Sazerac: The Roosevelt’s classic Sazerac Bar is a handsomely dark place to sip this brightly hued beverage. French 75: While not invented in New Orleans, the French 75 is closely associated with the city. Best sipped at Arnaud’s French 75 Bar, their version of the effervescent sip is made with champagne, lemon and Courvoisier — and frankly, it screams celebration. The Vieux Carre: Named for the French Quarter, this boozy libation is often tipped back at the Hotel Monteleone’s Carousel Bar and Lounge, where it was invented in 1930. The Brandy Milk Punch: Ideal for an early celebration, this creamy eye-opener is served with brandy, vanilla, simple syrup, milk and nutmeg, and is a staple at Brennan’s.